As John Locke said: “The end of law is not to abolish or restrain, but to preserve and enlarge freedom.” The Americans with Disabilities Act (ADA) is an amazing piece of civil rights legislation that has immeasurably increased freedom of access to the good things of life for the 19 percent of us who have disabilities. I, as a blind person, have benefited in a multitude of ways. When I travel around in the world with my Seeing Eye guide dog, I’m denied access much less often because people generally know that service animals are permitted in public places. When I request electronic copies of written information like meeting agendas or government documents, many people agree cheerfully. For those who don’t, I can gently remind them it is legally required. I as a blind person have benefited from the Americans with Disabilities Act in a multitude of ways. When I travel around in the world with my Seeing Eye guide dog, I’m denied access much less often because people generally know that service animals are permitted in public places. Website accessibility has improved a lot over the years, partially because of the ADA. When I shop for a dress online, access has gone from nothing (my screen reader just said “graphic, graphic” to describe the pictures) to good alt text tags describing length and style of the dress on some sites. I still will tend to ask a sighted friend to look at the picture and offer an opinion on whether it’ll look good on me before I plunk down my cash. Apps on the iPhone are wonderful when designed to work with VoiceOver, Apple’s built-in screen reader. I can identify denominations of paper currency, play Trivia Crack, and determine how many minutes I’ll have to wait for the next bus to arrive. I can download and read books, magazines, and newspapers. I can receive emergency notifications of bad weather by email on my iPhone. That truly beats hearing “beep beep” as an emergency notification scrolls across a television screen and not knowing where the tornado is! 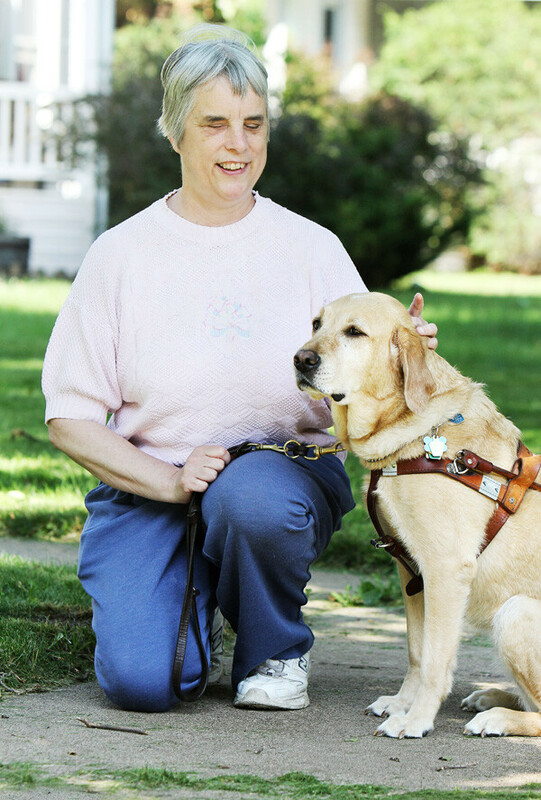 Katherine Schneider and her Seeing Eye dog, Luna, live in Eau Claire. Nowadays occasional restaurants have Braille menus, Hallmark stores may have one or two Braille cards and some pharmacy chains are implementing talking pill bottles so I would know for sure what medicine I’m taking. Print/Braille books allow me to read aloud to sighted nephews and nieces. Audio-described videos allow me to know who got shot when watching a murder mystery. Audio tours of museums add some culture to my life. When 2006 came around and I voted independently (using the “handicapped” machine) for the first time, I cried. Sighted Americans have a secret ballot, and finally I did, too. None of these accommodations are universal. Access involves asking, brainstorming, and sometimes being downright pushy. Most of all, it involves people of good will working together to implement the ADA. I’m celebrating ADA 25 by organizing exhibits at libraries offering programs in the community and designing an ADA 25th Anniversary card to hand out during July. You who advocate for access for yourself, friends, family, and the rest of the 19 percent of us who need it will make the next 25 years of implementation of the ADA even better. Let’s celebrate and then get back to work making the good things of life available to all. Katherine Schneider is a retired clinical psychologist at UW-Eau Claire, author, blogger (kathiecomments.wordpress.com), and advocate on disability issues in the Chippewa Valley. Thinkpieces are reader-submitted reflective essays. A wide variety of ideas, analyses, and notions are welcome. Submit your essay for consideration to giffey@volumeone.org.